What is the currency on this website? SeaChange Seafoods ships internationally, to you – or as a gift from you. Please note that Australia restricts entry of foods containing dairy products. SeaChange Pâtés contain dairy products, so please choose a different SeaChange product if you want to ship to Australia. Can I send to an address that is not my own? Yes, we can send gifts from you to any address in the world. You can even request a gift card enclosure with your message. Can I ship to P.O. boxes overseas? Shipping is calculated on the site before you confirm your order. We offer free ground shipping in Canada for orders over $50 and to the USA for orders over $90. For paid shipping, you will be offered several options, depending on the delivery destination. Please note that Small Packet Surface and Small Packet Air to the USA and International addresses do not include a tracking number. If you would like a trackable service please choose Tracked Packet or Xpresspost. If you have received a shipping confirmation email with a tracking number then you can use the link provided. Or Email us with your order number and we'll look into it for you. You will receive a confirmation email once your order has been shipped. If applicable this will also include your tracking number and a link so you can track your order. See our exchange & return policies here. Yes! We have a good number of delicious recipes and pairing suggestions - click here. Does SeaChange use wild salmon? Yes, SeaChange only uses wild salmon. We are also a member of Vancouver Aquarium's Ocean Wise program. Ocean Wise is a conservation program created to educate and empower consumers about the issues surrounding sustainable seafood. You can find out more about the program by visiting the Ocean Wise website. How much smoked salmon, crab meat, and lobster meat is actually in SeaChange pâtés? SeaChange Smoked Salmon Pâté contains 42% wild smoked salmon. SeaChange Crab Pâté contains 34% crab meat, and SeaChange Lobster Pâté contains 38% lobster meat. Is SeaChange salmon hot smoked or cold smoked? SeaChange Salmon is cold smoked. See Our Salmon page for more information. What type of hardwood do you use to smoke your salmon? 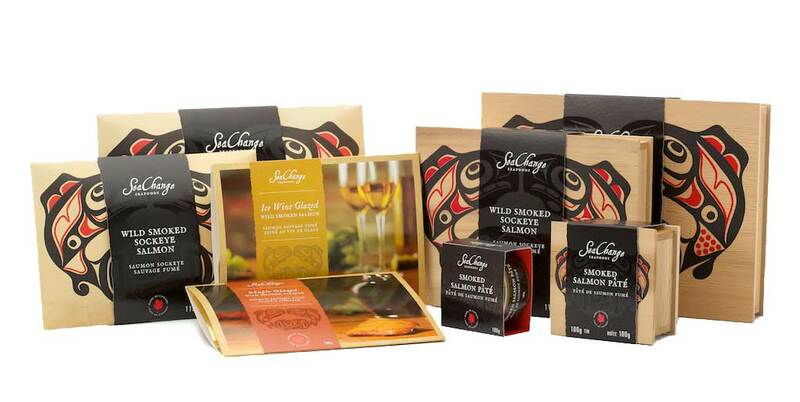 SeaChange salmon is smoked using a blend of maple (85%), birch (10%), and beech (5%). Do SeaChange foods require refrigeration? Unopened SeaChange foods do not have to be kept in the fridge. After you open the package and have enjoyed the contents, please refrigerate leftovers – if there are any – and use within five days. How long will my smoked salmon keep before it's opened? SeaChange Smoked Salmon is labeled as “Enjoy By” five years from the ship date. How long will my seafood pâté keep? SeaChange Seafood Pâtés have a 'Best Before' date stamp on the bottom of the tin which is five years from production date. Can I ship SeaChange products to other countries? Yes, our products travel safely in your luggage. Please note that Australia restricts entry of foods containing dairy products. SeaChange Pâtés contain dairy products, so please choose a different SeaChange product if you are travelling to Australia. To find a retailer that sells SeaChange Seafood products near you, simply visit our Store Locator to find the stores nearest to you. Yes. We've taken several steps to ensure all information received from our online visitors is secure from unauthorized access and use. All transactions are completed on a secure server. Secure Socket Layer (SSL) encryption is used for every transaction to encrypt the transmissions from our e-commerce servers as well as your computer. SSL encryption works by forming a matched pair, so that your computer and our server send data back and forth in an encrypted format.